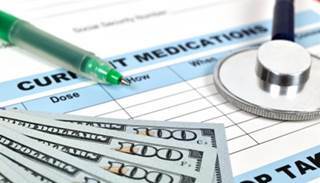 Multiple sclerosis drugs are driving the high payment per supply ratio seen in neurology prescribing patterns, a new study on retail prescription drug spending shows. The study results, published in Neurology, suggest that a focus on lowering drug prices will ultimately lower drug expenditures by Medicare, which spent $103 billion on prescription drugs alone in 2013. Despite a relatively small number of providers, neurologists account for one of the highest total prescription and per claim costs. In an attempt to identify specific drugs and prescribing habits behind this trend, Lindsey B. De Lott, MD, MS, of the University of Michigan, and colleagues conducted a retrospective, cross-sectional analysis of 2013 Medicare Part D Prescriber Public Use and Summary files. Of the 1 049 381 unique providers recorded in the file, 13 060 were neurologists (1.2%), which represent 99.3% of all active practicing neurologists in the U.S. in 2013. Of the $103.6 billion in drug payments in 2013, $5 billion (4.8%) were in neurologist-prescribed drugs — the third highest among all specialties. Notably, 75.7% of neurology drug claims were for generic medications. Median payment per neurologist claim was $176 and median payment per month for any neurologist-prescribed medication was $141 — the fifth highest among all specialties. Multiple sclerosis drugs had the highest total payment, accounting for $1.8 billion (44.1% of total drug payments by neurologists). None of the multiple sclerosis drugs available during the study period were available as a generic, with monthly payments ranging from $4,149 per month for teriflunomide to $5,072 per month for fingolimod. Antiepileptic drugs (AEDs) were the second highest drug category, accounting for $499 million, 33.6% of which was from generics. Median monthly payment for brand AEDs was $567; for those with both brand and generic available, median monthly brand payment was $622 and median generic payment was $41. AEDs were followed by dementia medications ($389 million), Parkinson's disease drugs ($332 million), and medications for neuropathic pain ($215 million). If direct generic substitutions occurred across all brand neurologist-prescribed medications, total payments would decrease by $269 million (6.5%). If that same principle was applied using Veterans Affairs (VA) pricing for specific diseases, total payments would decrease by $1.5 billion, or $4.5 billion for the same medications when attributed to any provider. For MS drugs, VA pricing would reduce payments by $724 million for drug prescribed by a neurologist; $887 million when attributed to any provider. For AEDs, VA pricing would result in a $301 million decrease; $153 million for dementia drugs; $151 million for Parkinson drugs; and $83 million for neuropathic pain drugs. Costs of MS drugs have continued to rise despite more medications entering the market. Unlike in other countries, Medicare is barred from directly negotiating drug prices. “Given the current pricing of MS drugs in the United States, neurologists have no cost-effective treatments,” they wrote. The authors suggest that allowing Medicare to directly negotiate drug prices could help solve the problem, although this tactic is notably controversial. The benefits of doing so, however, extend beyond Medicare, as “direct price negotiation by Medicare would undoubtedly influence prices negotiated by private payers as well,” they said.